Our first episode explores the namesake behind Volker Hall, the building that houses UAB’s School of Medicine: Joseph Volker. 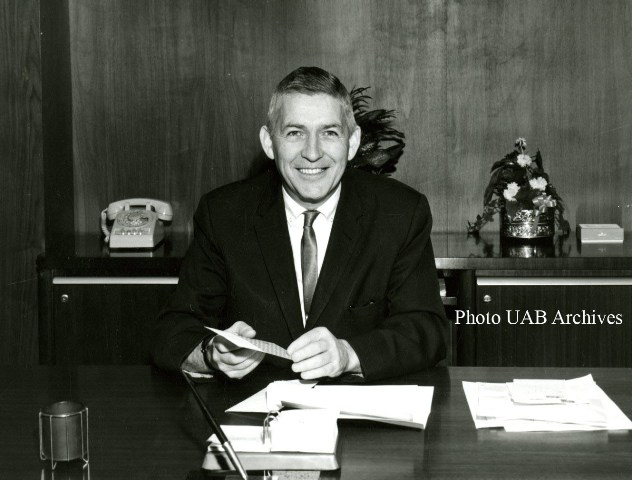 Dr. Joseph Volker shortly after taking office as UAB’s first president. Reproduced with permission from the UAB Archives. This episode was produced by Jeff Singer, Alex Reddy, Sebastian Chung, and Corey Duke. It was edited by Blake Holloway. Thanks to Dr. Scotty McCallum, Tim Pennycuff, and the other students who lent their voices to the show. We used New lights in the valley: the emergence of UAB by Tennant McWilliams, Building on a vision: A fifty-year retrospective of UAB’s academic health center by Virginia Fisher, and multiple oral histories from the UAB Archives. Our theme song was produced by Tim Littman, Samuel Altonji, Steve Kim, Leah Carpenter, Zac Whaley, and Corey Duke. Our show is made possible by a generous grant from UABSOM’s Student Senate. This entry was posted in Episode, Podcast and tagged Alabama, Birmingham, Civil Rights, Desegregation, Joseph Volker, Medical School, President, School of Medicine, UAB, Volker. Bookmark the permalink. Dr. Volker – what a fascinating man of medicine. I only have time for one podcast a month so RIP Serial. Keep up the good work, UAB.